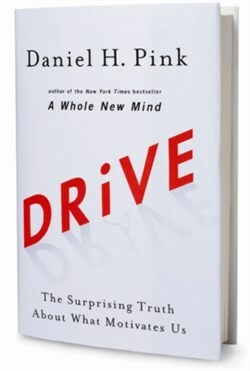 I'm reading this book by Daniel H. Pink entitled, Drive - The Surprising Truth about What Motivates Us. With convincing proofs from four decades of scientific research on human motivation, the book is basically saying that the carrot and stick approach is flawed. It explains that external rewards may produce good results but it often does more harm than good in the long run because it makes a person lose their intrinsic and altruistic interest for a certain activity. The book further explains that people are more motivated by internal factors such as a sense of purpose than by external rewards. This is especially the case when the basic financial needs of a person have been met. Weighing his statements carefully and if you dig a little deeper into your heart, you will find that even good things like family, future dreams or something as big as country will fall short in motivating you. Ultimately, that “something” larger than yourself is God. God is your ultimate motivation at work. With God on your side, you have no reason to be discouraged in your job or business. Because even when your work environment has become political, you know that no good or bad deed ever escapes God's sight and He is the ultimate judge. If God is for you, who can be against you? And even when your tasks seem to pile up every day, you can brush away the stress knowing that after you've given your best, your labor will not be in vain and God will grant you rest each night. Even when your excellence goes unrecognized and someone else takes the credit for what you've produced, you can rest in the fact that God is the source of promotion. It is God alone who judges; he decides who will rise and who will fall. God is your boss. Whatever you do, you can work at it with all your heart because you know that you are working for the Lord, not for human masters. He is your encourager, pushing you to do whatever your hands find to do with the best of your ability. He is your rewarder, promising to bless you when you earnestly seek Him for guidance and when you commit your work to Him. If a person believes these things, not only will he have the best work ethic but he will also experience great pleasure doing his work. Regardless of the type of work and industry you’re in, you can experience joy in its fullness for as long as you’re in God’s company always. You can experience everlasting pleasures if you’re at His right hand – when you know that you are close to Him and you are being used by Him. You can experience pleasure at work when you know that your labor is blessed and God is your supreme motivation.